Want to promote respect for life in a big way? Teenagers, college students and young adults who would like to support the Church’s pro-life advocacy efforts can still register for the archdiocesan bus pilgrimage to the 38th annual National March for Life on Jan. 24 in Washington, D.C.
Kay Scoville, the director of youth ministry for the archdiocese, said high school students, collegians, young adults and adult chaperones can travel in one of four archdiocesan buses to the nation’s capital from Jan. 22-25 for the peaceful and prayerfulp pro-life demonstration. The cost of the bus pilgrimage is $175 per person by Dec. 21 and $185 per person by the Jan. 7 final registration deadline. Early registrants will receive an archdiocesan pro-life sweatshirt. For more information about the bus trip, call the youth ministry office at 317-236-1430 or 800-382-9836, ext. 1430, or log on to the pilgrimage website link at www.archindy.org/youth/MarchforLife.html. Registrations must be made with a parish youth minister or school campus minister. 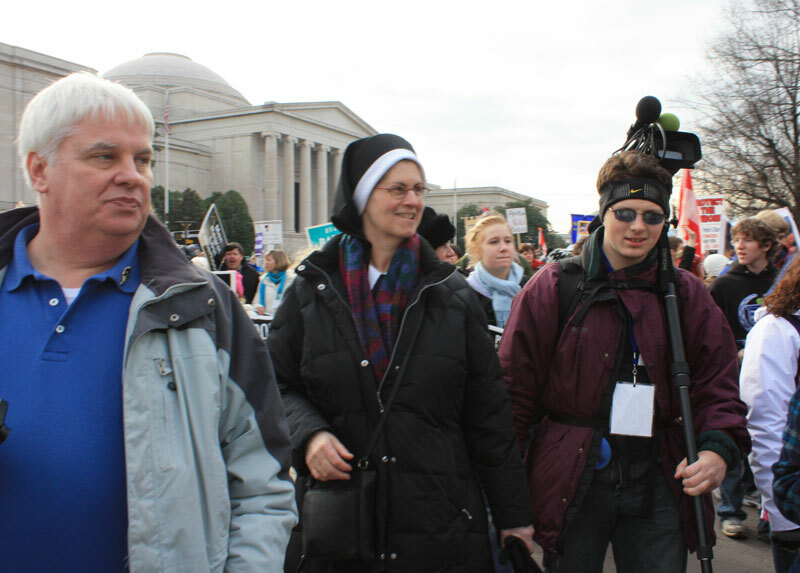 College students and young adults who want to participate in the National March for Life on Jan. 24 in Washington as well as the national conference of the Fellowship of Catholic University Students (FOCUS) on Jan. 21-23 in Baltimore can still register for the archdiocesan Young Adult and College Campus Ministry pilgrimage, which includes air travel. The cost of this pilgrimage is $219 for students and $299 for non-students. Reservations must be made by Dec. 17. For more information, send an e-mail to Matt Faley, the program coordinator for young adult ministry, at mfaley@archindy.org. To register for the combined pilgrimage to Washington and Baltimore, log on to www.indycatholic.org. These pilgrims will also need to register for the FOCUS conference at http://focusconference.org/baltimore. In past years, the archdiocesan Office for Pro-Life Ministry has collaborated with the archdiocesan youth and young adult ministries staffs to coordinate the March for Life pilgrimage. For the first time, Servants of the Gospel of Life Sister Diane Carollo, the director of the pro-life office, is coordinating a local, solemn pro-life observance on Jan. 24 in Indianapolis, which begins with Mass at noon at SS. Peter and Paul Cathedral and continues with a march from the cathedral to Veterans Memorial Plaza for a downtown prayer rally. Scoville said youth and young adult participants in the pilgrimage by bus will gather at the cathedral for a 6 a.m. Mass on Jan. 22 before the group departs for Washington. On Jan. 23, these pilgrims will have an opportunity to tour historic sites and museums at the National Mall in downtown Washington. Due to overcrowded conditions each year during the National Mass for Life at the Basilica of the National Shrine of the Immaculate Conception, the bus pilgrims will not participate in that liturgy this year. Instead, they will participate in the “Life Is Very Good” rally in Arlington, Va., which includes Mass as well as a concert by Catholic musician Matt Maher. On Jan. 24, members of both pilgrimage groups will participate in a pro-life Mass at 9:30 a.m. in the Crypt Church at the basilica, which will be celebrated by Archbishop Daniel M. Buechlein. pro-life march with parish and school groups.